“Out in the wine dark sea there lies a land called Crete, a rich and lovely land, washed by waves on every side, densely populated and boasting ninety cities”. Homer The Odyssey. Book 19 172-174. While Homer may have taken poet’s license in his description, Crete was, by all accounts, in ancient times, a rich and lovely land. It was a land blessed with great natural wealth – wood, stone, fertile pastures and sheep. But more important by far than the riches of the Cretan soil or the loveliness of the land, was its position. Situated in the very in the centre of the Eastern Mediterranean, it had access by sea to every corner of the known world. Somewhere around 3400 BC, King Minos came to power. Son of the god Zeus and Europa, Minos brought great wisdom and vision to his reign and Minoan Crete was peaceful and prosperous. Mighty palace complexes were constructed, at Knossos and Phaestos, for Minos and his brother Radamanthys, respectively. The Minoan Navy reigned supreme in the Aegean and its merchant vessels roamed unchallenged, trading pottery and cloth along the Mediterranean shores. 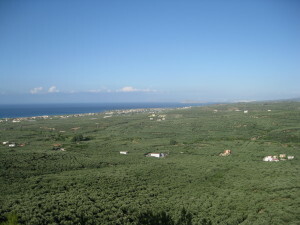 For over 2000 years Crete was the cradle of Western of Western civilisation. Later, historians and archaeologists would describe the era of the Minoans as a “golden age”. It soon became clear, though, that the power that held Crete, held sway over the known world. The tiny island became a much-coveted prize. In 1375 BC, the Myceneans of mainland Greece invaded Crete and the rich Minoan culture was destroyed. In 1100, the Dorians seized it from the Myceneans and Crete became one of the Greek states. Then Greece, with the jewel of the Mediterranean in its crown, entered its golden age. No traveller to Crete can claim to have fully experienced the country without sampling a convivial shot of the national drink, tsipouro or tsikoudia, otherwise known as raki. Dubbed Cretan fire-water because of its swift, sometimes even dramatic effects, this potent liquor is distilled from wine-must, or the dregs of grapes which remain after the wine is made. Greek raki originated in a monastery in Macedonia in the fourteenth century. Gradually, the secrets of production and the delightful effects of the drink spread throughout Greece and across the Aegean Sea into Crete. 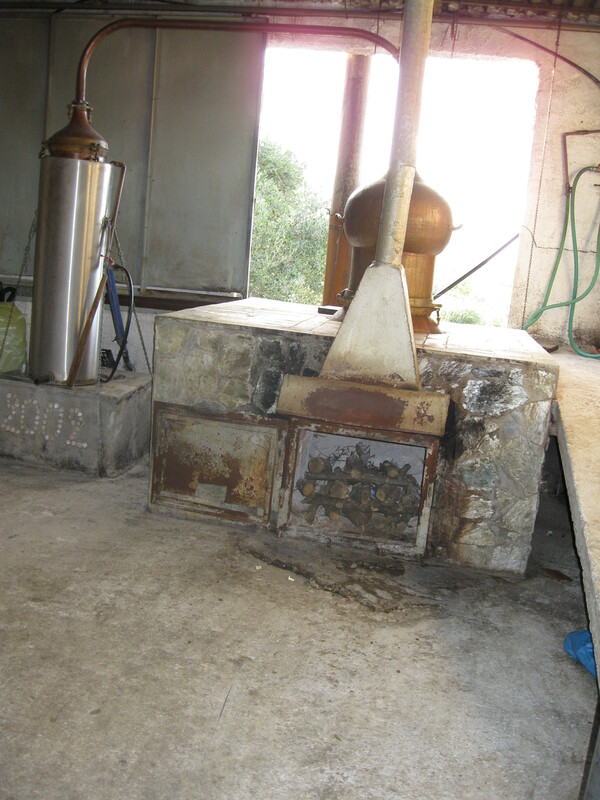 Many small villages in Crete still have their Rakizio, or distilleries, and the process of producing raki remains pretty the same as it was when the Macedonian monks passed it on. First of all, after the grapes are harvested and processed, the must is collected in large tank and left in the full sun for four weeks. At the end of the month it is brought in to the Rakizio to be distilled. Distillation takes about three hours and the end product is a strong-flavoured clear liquid with an alcohol content of 40% or more. Back home on the farm, the vintage is celebrated with a family feast. Needless to say, a great deal of new raki goes down in the celebration. 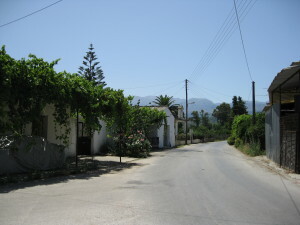 The very best of Cretan raki comes out of the village distilleries and it is said that good pure raki is hangover-free. However, novice drinkers are warned to take it slowly as the risk of throwing up or falling down is high. Furthermore, as it is impolite to refuse the offer of a re-fill, it is wise not to empty your glass too often! Hidden away among the olive plantations in western Crete is the little village of Vouves. There isn’t a great deal in Vouves, just a Kafenion, and a cluster of houses drawn in around a central square. In the middle of that square, however, is one of the world’s oldest olive trees. 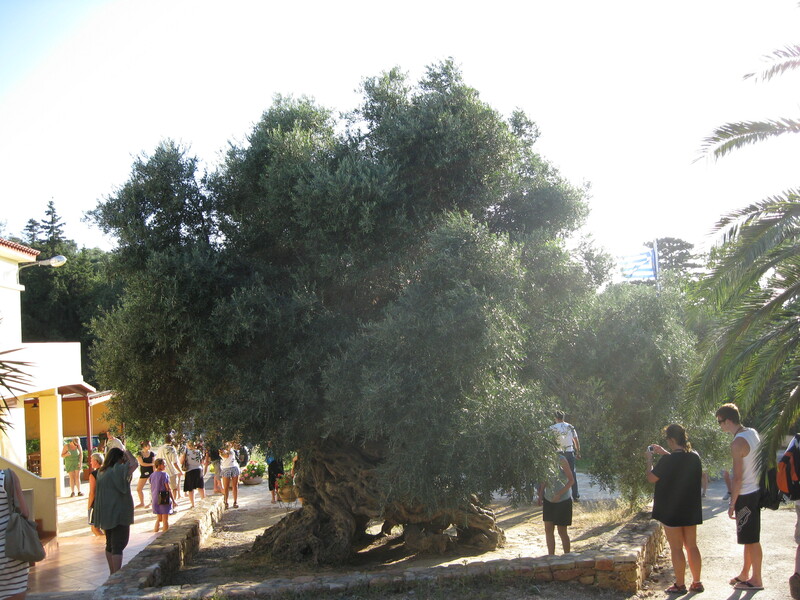 Opinion varies on the actual age of the Vouves olive tree. Scientists from the University of Crete estimate that it is 4000 years old, while arborists, using ring bark analysis, put it at 2000. Whatever its years, age has not wearied or diminished the Vouves olive. It stands firm, strong and proud at the heart of the village. Its gnarled trunk measures a massive 12.5 metres and its leaves are thick and lush. 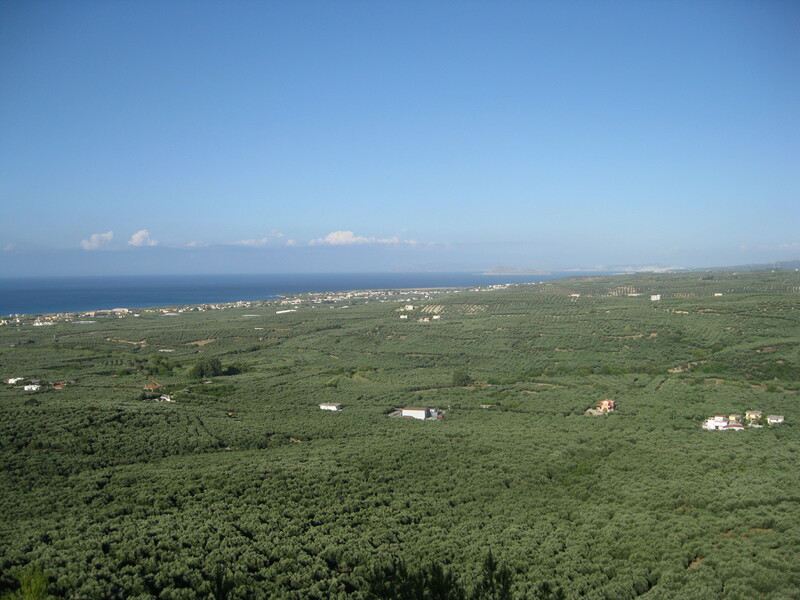 Most incredibly, though, it still produces olives. From a rugged hillside in Western Crete, the Cave of St John the hermit looks out over endless olive plantations to the sea. Even without its icons, its altar, its lingering perfume of incense and beeswax candles and the saintly presence of the old priest in his sandals and coarse brown robe, it has the unmistakable feel of a holy place. There’s something about it that compels the visitor to hush and be still. Even when the famous “Little fun Train” chugs in and unloads a rowdy troop of tourists, a sense of peace prevails. The cave has always been a place of prayer and refuge, where the ancient gods were worshipped and where pilgrims were sheltered and restored. After they were converted to Christianity, the faithful of the region gathered in the cave for mass. In the 16th century, a hermit named John and his followers, known as the 98 Fathers of Crete, moved into the cave. They built a church and a monastery which offered a place of prayer, refuge and healing. It was Saint John who uncovered the miraculous spring which trickles from a rock near the cave and which, over the centuries has effected countless cures. Every year, holy water from the spring is distributed to thousands of Christians on the Festival of Saint John the Hermit in October and on Christmas Eve. 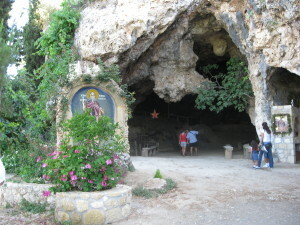 Daily masses are held in the small church of Saint Spyridon, in the north eastern corner of the cave. Special celebrations take place on the Feast of Saint Spyridon in July and at Christmas. 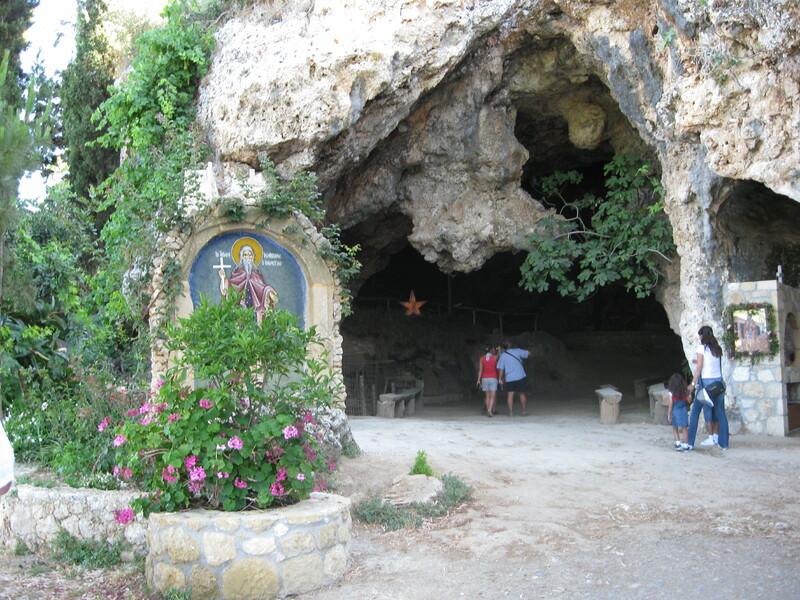 There are daily masses in the small church of Saint Spyridon, in the north eastern corner of the cave. Special celebrations take place on the Feast of Saint Spyridon in July and at Christmas.